Faith and I love crafting for our Girl Scout Cookie booths and this banner is no exception! In the past, we have made displays, bookmarks, even crowns for our booths, and this banner was a perfect addition that can be saved from year to year. Carefully pull each box apart on the seams and flatten. Cut off the tops and sides, saving the front and back of the boxes. I used the industrial paper cutter we have at work, it was much easier to deal with cardboard that way! On the back (non-printed) sides of your box, measure the width and mark the bottom center point with a dot. Measure up each side 1-2 inches (your choice) and mark those with dots as well. This was the hardest part, measuring to keep it even. Cut a diagonal line from the each side dot to the bottom center dot to form a point. Repeat for each piece you plan to use. Line up the boxes how you intend to use them with the upper corners overlapping. We did 2 sets of each front (12 pieces) for one banner and 2 sets of each back (12 more pieces) for a second banner. Using the paper piercer, poke a single hole in each upper corner of each box. Mine were somewhere between 1/4 and 1/2 inch in from the corner. Set the upper left corner of one box on top of the upper right corner of the next box, align the holes and poke a brad through to seal them, bending the legs back on the opposite side of the banner. 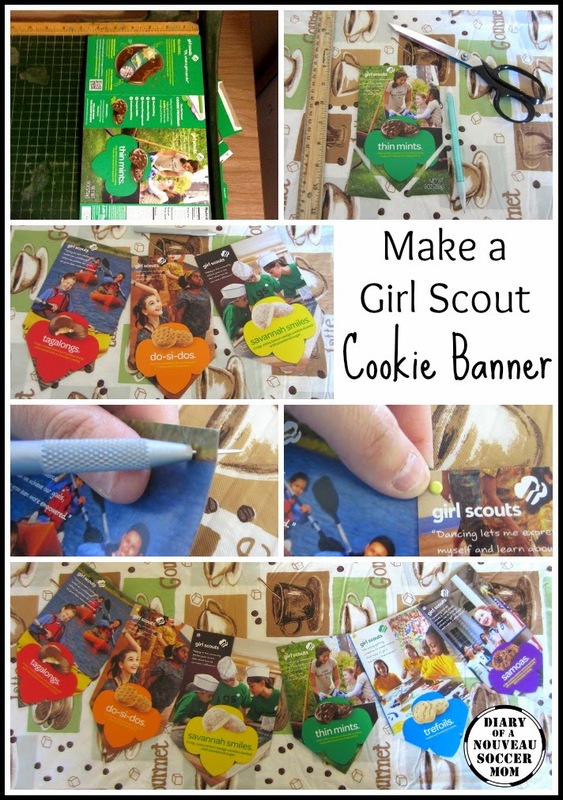 Repeat for each banner piece until the desired size is achieved. Half banner, we opted to double it to fit our table! Optional: For the outside flags, a hole punch and ribbon can help you attach them to your booth. 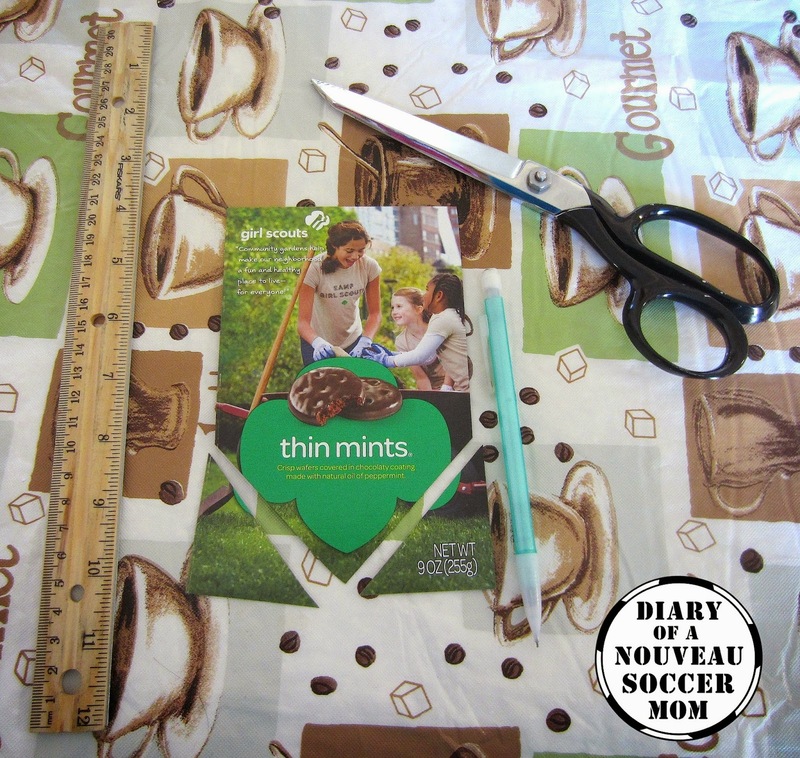 We used clips instead, but it depends on the location and style of your actual cookie booth! 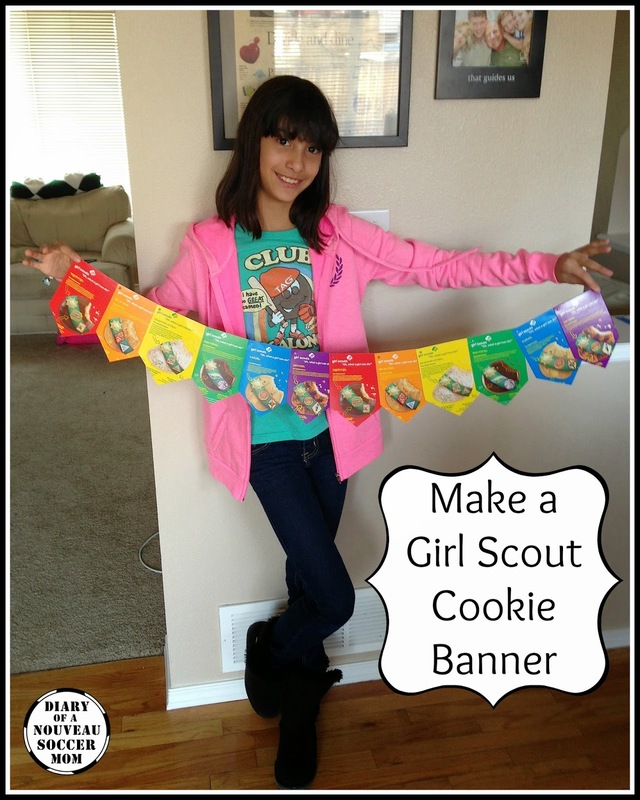 Looking for more cookie booth ideas?